J.R. Gingersnap. DOB= 4/5/08; Sire=K.C.Just Respect; Dam=J.R.Ginger; 23.5"ttt@ 9.5 months; 35.5"ttt@ 14 months; alot of horn in her pedigree. Service sire=Viking who has 65.5"ttt@27.5 months. She has 20%Gunman in her pedigree! 47"ttt of high horn @ 22 months! She is top notch! 51"ttt@25.5 months; 56"ttt@33 months! 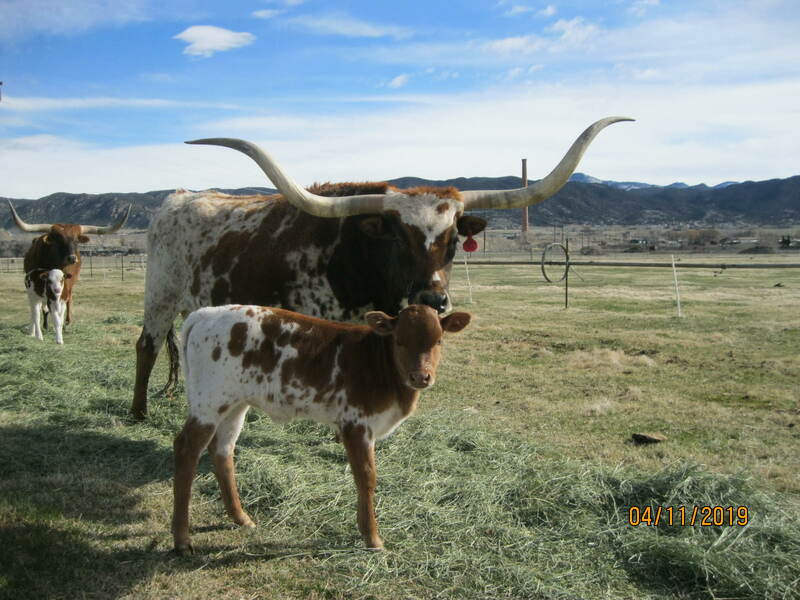 For'11 she has a beautiful heifer calf, Greta, by the pretty blk and wt bull, Quixote! This is a home run genetic package! She measures 60.75"ttt@ 40 months! She's a grand- daughter of the great 80+"ttt Gandi cow!! 67.25"ttt@4 years; 68.5"ttt@ almost 5 years; 71.5"ttt on 4/8/14 at 5 years of age. 74ttt@6+years. For 2015 she has a great bull calf by the Ace. 78ttt on 1/09/18. This bull calf has been sold to Curtis and Ross Ohlenforf of Austin, Tx. Her full sister, Gingerale just sold at the Select Sale for $10750 to Russel Freeman of Yoder, Co.
For '18 Gingersnap has an exciting heifer calf by Gambler...this calf should really be special. All of our cows are bred back to Gambler for March-May '19 calves. For '19 she has a heifer by Gambler. $3000 for the pair.